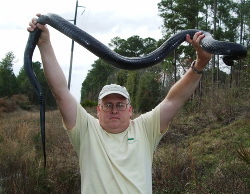 Jeff is interested in all aspects of herpetology, natural history, and conservation—especially in North Carolina and the southeastern United States. General research efforts are directed toward gathering basic information on the natural history, geographic distribution, and conservation status of all reptile and amphibian species in North Carolina. Specific projects include Project Bog Turtle (an initiative to conserve the Bog Turtle and its habitat in the Southeast), Project Simus (an effort to gather information on the natural history and status of the Southern Hognose Snake, as well as other rare components of sandhill communities, in North Carolina), and radio telemetry studies with several reptile species (Southern Hognose Snake, Northern Pine Snake, Eastern Coachwhip, Eastern Chicken Turtle) in the North Carolina Sandhills. Davis, E., J.C. Beane, and J.R. Flowers. 2016. Helminth parasites of pit vipers from North Carolina. Southeastern Naturalist 15(4):729-741. Beane, J.C., S.P. Graham, T.J. Thorp, and L.T. Pusser. 2014. Natural history of the southern hognose snake (Heterodon simus) in North Carolina, USA. Copeia 2014(1):168-175. Beane, J.C. 2013. Dietary records for the eastern coachwhip, Masticophis flagellum flagellum (Shaw, 1758), in the southeastern United States. Herpetology Notes 6:285-287. Beane, J.C. 2013. New geographic distribution records for reptiles from North Carolina, USA. Herpetological Review 44(3):478–481. Beane, J.C., A.L. Braswell, J.C. Mitchell, W.M. Palmer, and J.R. Harrison III. 2010. Amphibians and Reptiles of the Carolinas and Virginia, 2nd Edition, Revised and Updated. University of North Carolina Press, Chapel Hill. vii + 274 pp.